As a member of the Mosaic Reviews Team, I received the Waterproof Bible in the English Standard Version to review. 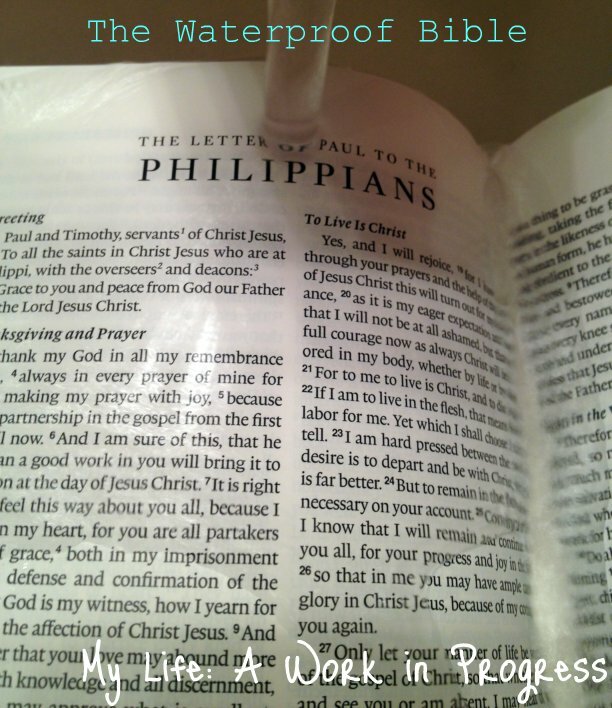 The Waterproof Bible is designed to allow you to carry God’s Word with you, wherever you go. Made with synthetic materials, the pages are waterproof and dry quickly. They’re also stronger than paper, and you can still write on them with ball point pen, pencil, or a dry highlighter. 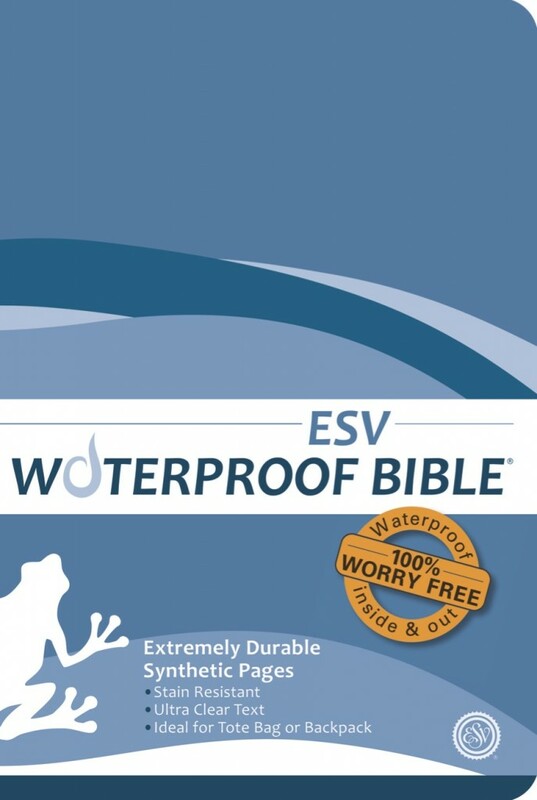 The Waterproof Bible is available in the following versions: King James, New King James, New International, New Living Translation, and the English Standard. I’ve taken the Waterproof Bible to the park and to the beach. Sand and dirt just rubs off easily. The pages are sturdier than a traditional Bible too. They’re less likely to rip, so I think this would be a good Bible for Baby J when he’s older (and reading, obviously). To test what water does to this Bible, I held it open under the kitchen sink faucet. The water just ran down the pages. It was pretty cool! It reminded me of the Indestructibles books I bought for Baby J. I’d like to go camping this summer, and if I do, I’ll bring this Bible along, so we can have devotions together as a family. I was impressed with the Waterproof Bible, and I wish I had one when I was deployed to Afghanistan. It’s small and light enough that it wouldn’t have added much weight to my pack when traveling. To learn more about the Waterproof Bible including prices, colors, and customization options, visit their website. That’s a really good idea. I keep my Bible with me electronically to avoid page rips, but I don’t want to take my tablet to the beach or anywhere it can be so easily damaged, so this would be a great thing to have on hand! What a great thing! Would be great for the pool! Thats really awesome, they should make all books like this would save and the need to replace them! Wow! I’ve never seen these before! This would be great for poolside reading in the summer–this is a must have! How cool is this?!? If I had a waterproof bible, I could read poolside! !